Many feelings come to mind when one thinks about a job hunt. Frustrating. Overwhelming. Stressful. It should be an exciting time of change and new beginnings, but the process can take a lot of time and effort. When you start to feel like your job search is leading to nothing but dead ends, it is time to give your tactics a boost. Here are a few examples of how to rejuvenate your job hunt and get your career back on track. Your job hunt should not be a secret! Do not be embarrassed to tell friends and colleagues that you are currently looking for a new job. If people know you are open to new opportunities, they are more likely to pass along information about openings or upcoming openings your way. Ask colleagues for career advice and even ask them to look over your resume! A new pair of eyes will help point to any holes or potential edits. A great option is to work with a recruiter, like M4 Workforce Solutions, that can help you find the perfect job opening to fit your skills, experience, and career goals. We offer career support, advice, and real answers to how job seekers can best grow their career. Are you marketing yourself correctly? You should be using keywords in your resume and online professional profiles that relate to the types of positions you are applying for. Pick highlights from your career to share on your resume and check for gaps. If there are gaps, are there other projects that could fill in or explain in a cover letter? Life experiences can help you land a job too. Share your travels or side projects to help fill the holes. When you start applying for jobs, especially on major online job boards, visit the company website to find the job listing and apply directly on their website instead. Go directly to the source to push your resume to the front line. Make sure you are submitting resumes in the correct format! It would be a shame if you were not considered for a job that you are qualified for just because you submitted a word document instead of a pdf. Save your documents in a variety of formats (.doc, .pdf, .rtf, .html, etc.) and you will be prepared for whatever is asked during the application process. Job hunting is daunting and at times requires as much of your energy as a full-time job. If you are looking for long-term employment, you should be spending at least 30 hours a week trying to find it. Apply straight to the source as often as possible. Spend more time networking. Go to professional lunches, meet with friends in your field to discuss your search and career plan. 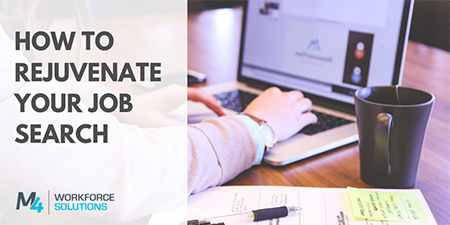 Tailor your resumes, cover letters, and emails for each job. Fine tune your LinkedIn profile. Make more of an all around effort, it will pay off when you land a job that fits you and your situation! If you would like to discuss your job search with a recruiter at M4 Workforce Solutions, please call or email us today.